In the Royal Academy’s survey that treacherous line only occasionally comes into focus. 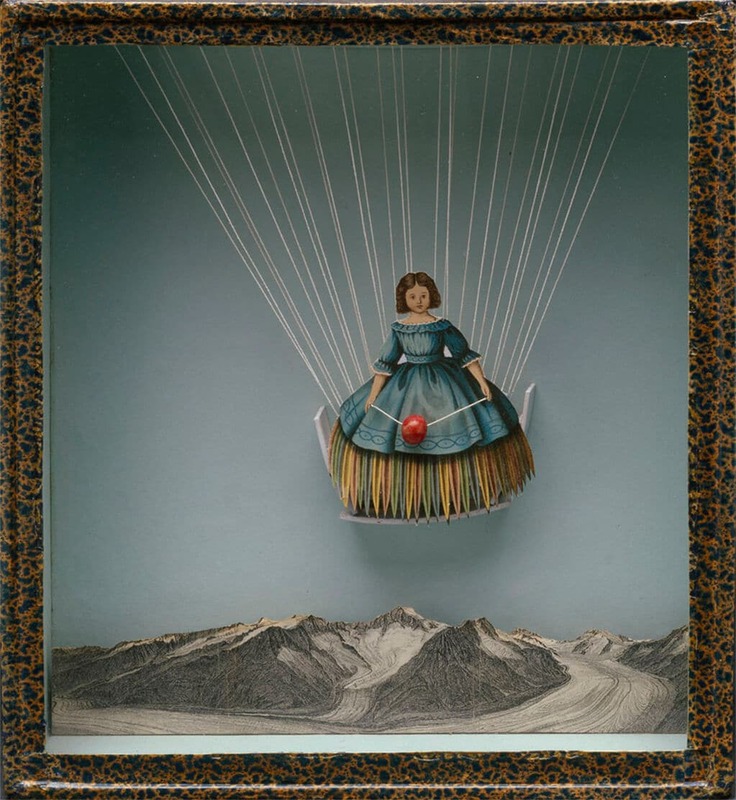 A cut-out girl (pictured), serene, weightless, borne up on white cotton threads as she daintily floats over the Alps in crinoline that echoes the shape of a hot-air balloon, is surely one such piece that skirts that line and wobbles. 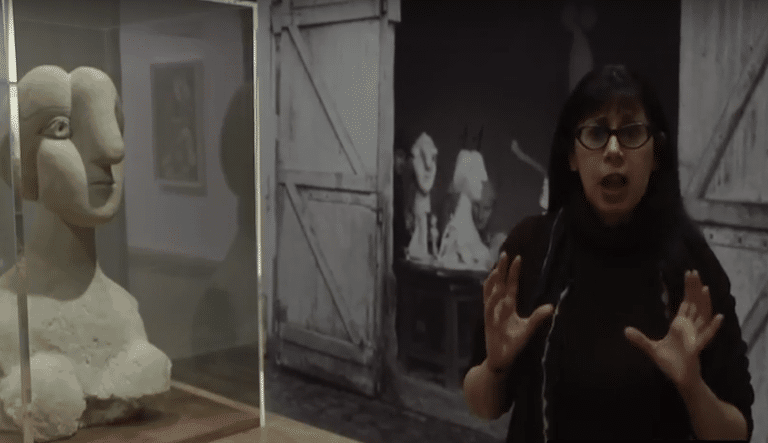 The work was made in homage to the dancer Tilly Losch, one of several of the artist’s pashes on ballerinas and stage starlets. And often these are the least successful of his works. The best pieces are the cabinets of repeated motifs: the white grids of his “Dovecoates” series, with their sequence of balls or wooden cubes; and his “Medici” series, where we find a tiny inky portrait, times 20, by a follower of Caravaggio, accompanied by 20 inky balls. The inky balls somewhat suggest the perfect, pared-down Mannerist head of the subject, which in turn resembles an egg in its shell. One thinks also of Koons’ weird couplings of blue balls and classical statuary and Warhol’s repeated inky screenprints. 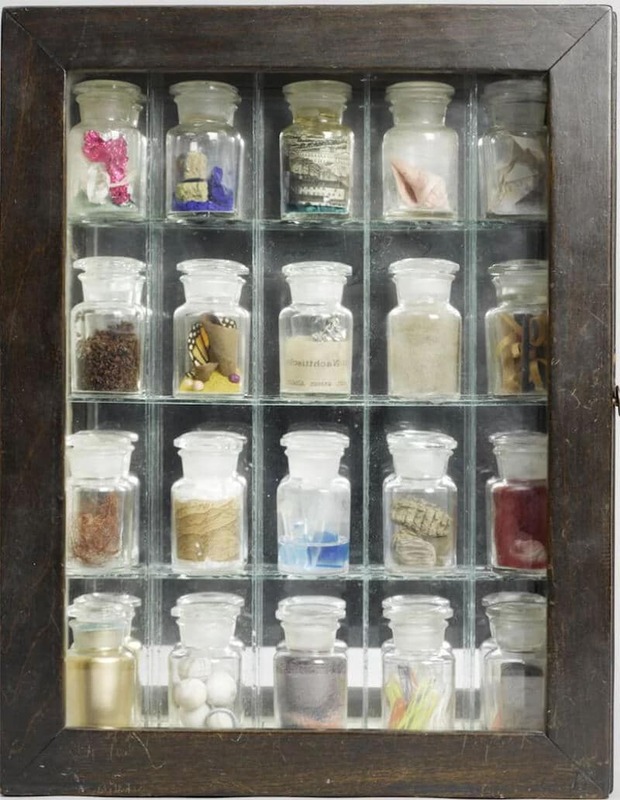 The Pharmacy cabinets, too (see picture), with their vials of coloured pigments, shells, butterfly wings, which predate Damien Hirst by five decades. None, however, express the lyrical “tone poetry” of Cornell. This review first appeared in The Arts Desk on 12 July, 2015.